Each & every artist has a few tips, tricks, or thoughtful pieces of advice that they can pass on to others. 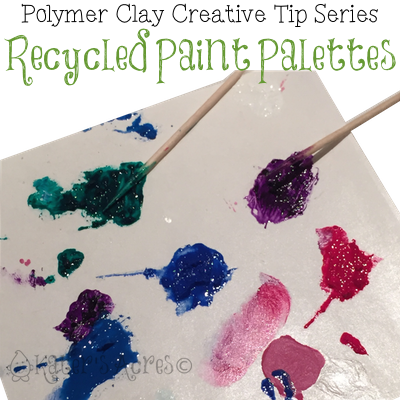 As I was adding some paint details to one of my items the other day, I sat looking at my typical paint palette and I thought, “you know, this is something my readers might like to know.” So … today with you I share my secret recycled paint palette … okay, so it’s not really a secret, but it is a good tip! I’m a big fan of recycling. This is both a good thing and a bad thing. It’s a good thing because there’s never a “lack” for a found item. this is a bad thing because … well … it causes hoarding tendencies. It’s a good thing I’m NOT above purging the junk out of my life 2 times a year then, huh?! Because I do a lot of shipping (mostly of the cute little yellow guy everyone loves, Parker) I tend to accumulate a lot of the backs of labels. You see I print my labels from my computer. I print them onto self-adhesive sheets. What does that mean? It means that after I print the label, stamp it with Parker, and put it on a box, I have this piece of paper leftover: half shiny & half matte. But my favorite use of my shipping label backs is to make a make-shift paint palette. The shiny side is awesome to squirt a little bit of paint on, blend colors, try out colors, test your brushes, make tones & tints, and so much more. I use toothpicks to blend many of my colors as well. Then when you’re done … just throw it away. Gather your used shipping label backs. Squeeze a little bit of paint onto the paper. Blend colors using brushes or toothpicks. When finished: throw out the paper. Do you use shipping labels for something in your studio? Leave your comments below. My labels come as A4 sheets of 8. I use the A4 label backs to store Mokume gane slices in one half and fold over the remaining half as protection. Now they can be stored just like a book! Great idea Carolyn! I haven’t had a need to mix exact colors to match something, but when I do, I’m going to use your trick. Thanks for sharing. I use my palette but this is a super idea! I also use parchment paper for a dozen uses since I don’t print that many labels yet. Now, my personal address label papers? Yes, I have a new use and can stop tossing them all! Thanks! One thing you said caught my eye. How did you make Parker label stamps? I’ve been trying ideas, but none suit me yet. Hi Lisa, I had some rubber stamps made and then just use them on my boxes. Easy, peasy! I recently got a NeverKnead clay conditioner. I use the shipping labels on the plates of the press to keep the surface clean (held in places with a little double stick tape). Sometimes the pigment from the clay does hang around (anybody else ever get red hands?) and this makes it simple to clean up. It usually lasts a while before needing (kneading?) to be replaced. Oh yes Leah, the possibilities are endless. And let’s be honest … who DOESN’T want LESS clean-up?